“Lege artis. 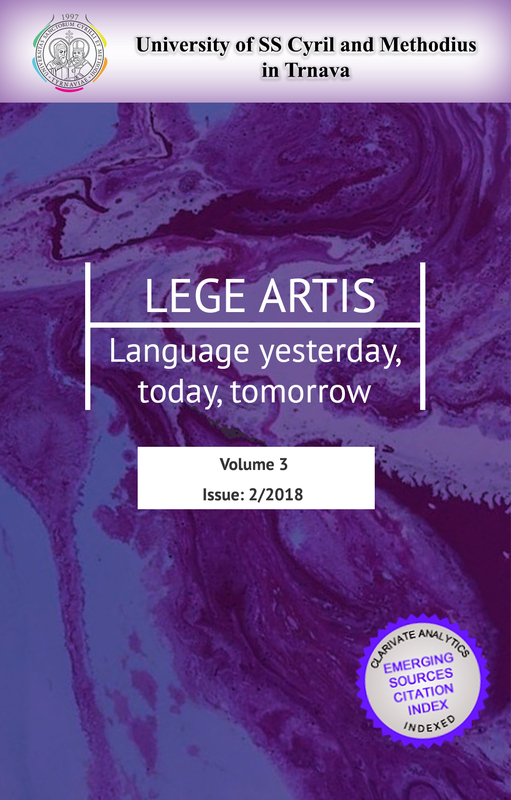 Language yesterday, today, tomorrow” is a biannual scholarly online journal in linguistics issued by the University of SS Cyril and Methodius in Trnava. It aims to publish innovative research articles that contribute to understanding language-related issues from synchronic and diachronic perspectives. The Journal welcomes papers addressing a wide range of traditional language disciplines as well as multidisciplinary and interdisciplinary studies. We have a strong international editorial board, each member of which represents a school of linguistics, a university, or a country: China, the Netherlands, Norway, Russia, Slovakia, Spain, Ukraine, the United Kingdom, and the USA. Our webmasters created an excellent website, which, within a short period of time, has attracted visitors from 99 countries all over the world; we are proud to add that the number of our visitors is constantly increasing. The Journal is a participant of a growing community of CrossCheck System users in order to ensure that the content published is original and trustworthy. Although the cover dates of the Journal are June and December, since June 2018 no deadlines have been set. Consequently, we will prioritize the publication of those articles only, which have been thoroughly reviewed and proofread by the time the Journal is due for uploading. Note that special issues of the Journal, based on contracts with universities and other educational establishments, may have other cover dates than indicated. We want to inform our authors as well as visitors of our web site that we have completed and signed all the necessary documents required by General Data Protection Regulation (GDPR), which came into force on May 25, 2018. Since January 2019, we use the programme Analytics Google that allows us to trace the number of clicks and downloads of the documents uploaded at our web site and published articles. Analytical report of all the events will be done and presented to the public in December 2019.